Raw Oysters at Nats Park? It’s Really Not That Weird. Nationals Park will debut an oyster stand from Harris Creek Oyster Co. for the 2019 season. Photo by Jonathan Stahl. Nationals Park will offer a lot more than hot dogs and beer when baseball season kicks off today. Chilled peanut noodles, bubble waffles, and steak-and-fry sandwiches are among the new concession foods. But the item that seems to be getting the most divisive reaction? Freshly shucked oysters on the half-shell. This is not the first time Harris Creek Oyster Co. founder Alex Johnston has encountered skeptics who say oysters and baseball just don’t mix. The family-run oyster farm based on Maryland’s Eastern Shore started selling its bivalves at Baltimore’s Camden Yards last year. He’s right. Eating oysters is a great way to enjoy a ballgame. And no, it’s not weird at all. Chances are a lot of fans are already slurping them before or after the game anyway. Harris Creek Oyster Co. has supplied The Salt Line with its house oysters since the seafood restaurant opened across the street from the stadium in 2017. In advance of this season, Johnston approached the Nationals about making the short leap inside the park. For its part, Nationals Park wants its food offerings to reflect the city’s dining diversity. “For the traditionalists who want a hot dog, we still have lots of delicious Hebrew National hot dogs. But because people come to 81 baseball games a year, they want variety,” says VP of Ballpark Operations Jonathan Stahl. The stadium has dipped a toe into oyster sales before. Last year, Grace’s Kitchen served fried oysters in po’ boys. Raw oysters have also made appearances at the Delta Sky360 Club lounge. But this is the first time freshly shucked oysters will have their own dedicated kiosk. Stahl also sees the eco-friendly shellfish, which help to filter waterways and provide a reef for other creatures in their ecosystem, as another facet of the ballpark’s sustainability mission. Special bins around the oyster stand will collect used shells for the Oyster Recovery Partnership, which returns them to the Chesapeake Bay to help rebuild oyster beds. Harris Creek Oyster Co.’s oysters. Photo courtesy Alex Johnston. For those concerned about the safety of eating raw shellfish on a hot day, it’s a myth that you should only eat oysters in the eight months of the year that contain the letter “R.” Johnston says the oysters go straight from the water into coolers with ice. The Harris Creek team then transports the oysters to a cleaning shed, where they’re quickly power washed, then packed back into refrigerated containers. Usually, they’re delivered and sold within 24 hours of harvest. Look for the a tag detailing the date and location of the harvest right in front of the stand. The oysters will be sold from a boat-shaped cart under the scoreboard on the Budweiser Terrace (section 238). They’ll be immersed in ice and professionally shucked to order. 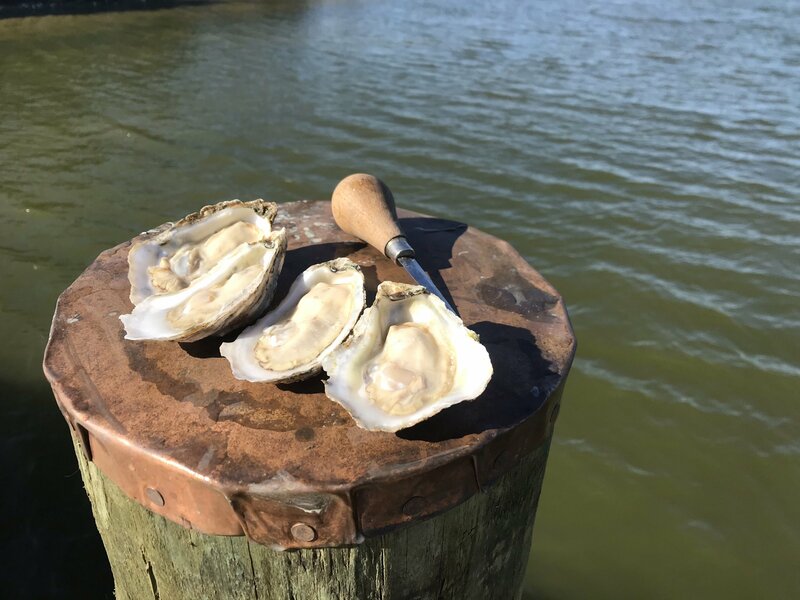 In addition to Harris Creek’s own oysters, their stand will also offer Rappahannock oysters purchased through seafood distributor J.J. McDonnell. (Nationals Park wanted Virginia oysters to add wider regional appeal.) The oysters will be sold by the half-dozen with lemon wedges and various condiments. The stand will also sell beer and oyster shooters with bloody Mary mix and vodka. And if that still sounds out-of-place to you? Maybe head to Nationals Park’s sushi stand.